Once upon a time, a little four year old girl went to sleep. While the busy Birthday Fairy put the finishing touches on the birthday magic. Such as hanging a birthday banner**, strategic gift placement, and a special announcement made. So that when the Birthday Girl stumbled downstairs in the morning, as a brand new FIVE year old, she would be surprised. And just a smidgen excited. See? Then BG enjoyed a nutritious breakfast before school. Okay, nutritious might be a stretch. It was colorful. While BG was at school, the Birthday Fairy whipped up the Coca-Cola cake. 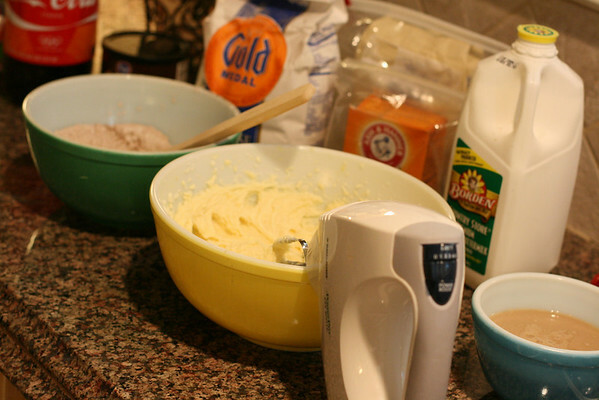 Using my grandmother's Pyrex mixing bowls made it seem like A. 's great-grandparents were sharing in BG's big day as well. The Birthday Fairy felt a tad sentimental. Misty even. Birthday Wizard (AKA Scott) came home for lunch, and brought McDonald's. BG was thrilled. She also got to open a few presents. We like to stretch out the festivities for as long as possible. This year the Birthday Fairy and Wizard brought JUST the right presents. Someone should buy stock in Disney. I'm just saying. BG is over the moon about all things Ariel and High School Musical. The Birthday Fairy is rethinking the whole microphone idea right about now. 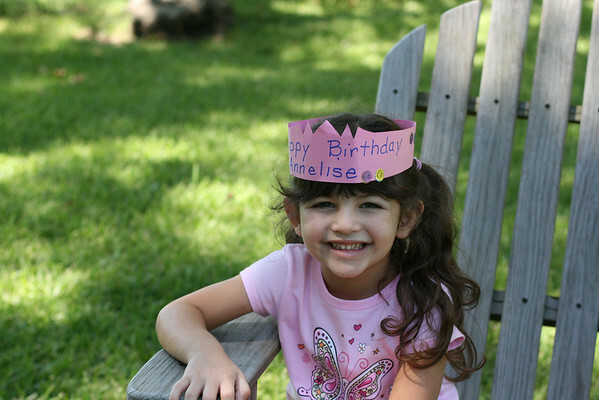 Her teacher made the Birthday Girl feel special with her very own crown and a trip to the treasure box. 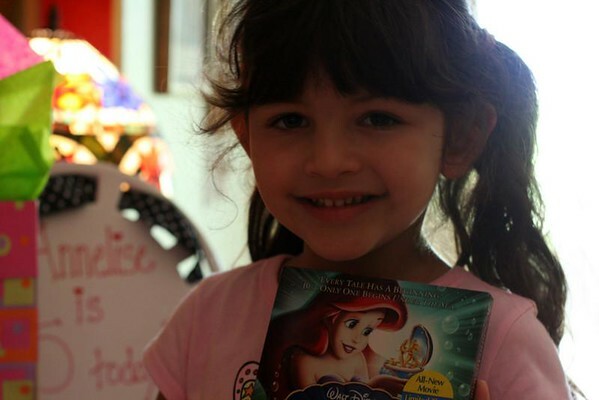 A sweet friend in her class gave her a princess puzzle (what a thoughtful surprise). BG shared pink sugar cookies with her friends--which were scrumptious, she reported. 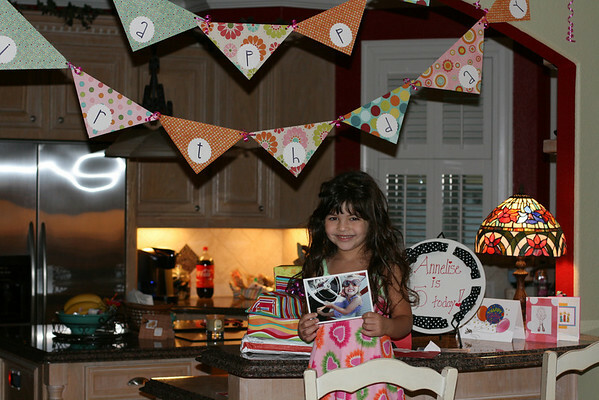 BG was also excited about the awesome (her word--now that she is five, everything is awesome) birthday napkins. These were actually a hodge-podge of leftover napkins from the last three years. Shhh. BG was gracious enough to pose for a few pictures to document the momentous occasion of turning FIVE years old. Happy Birthday Sweetie!! We love you to pieces!! *Stay tuned for Acts II and III of The Birthday...coming soon. **Making the birthday banner was rather amusing, at least to me. I tried to recreate those cutesy wootsey pennant banners like this one out of 12X12 scrapbook paper. For the life of me, I could not figure out how she managed to get 3 pennant triangles out of each sheet. Not being mathematical and more of an Oh Let's Just Wing It type of girl, I ended up with more traditional triangles. That may or may not be the same size. Annelise still loves it. This morning she exclaimed, "Oh my goodness! Did you make this for me?" The Birthday Fairy's heart swelled. Happy Birthday, Annelise! Everything looks like it was made with lots of love! By the way, how lucky is that girl to have an "i" in her name? I always wanted a heart over an "i" in mine! YEAH YOU!!! I Love the pic of her in her bed. SO sweet. 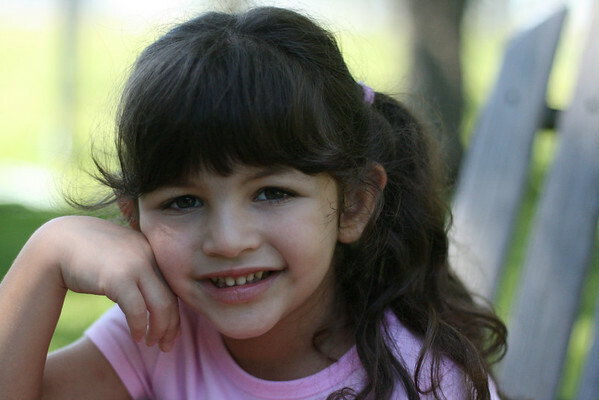 Happy Birthday wishes to the prettiest 5 year old birthday girl around! I can't wait to read all about Act 2 and 3! 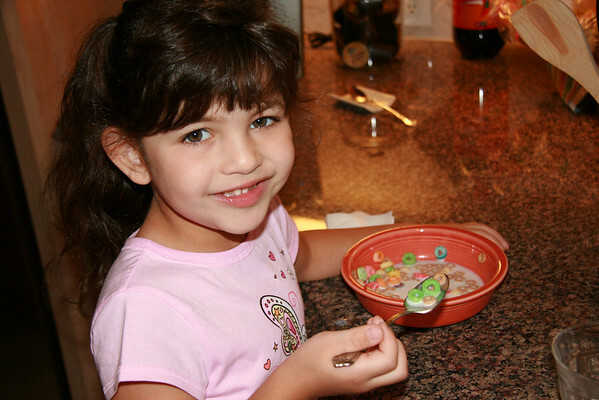 About that colorful cereal: I did hide plain Cheerios underneath the fruity loops. Aren't I sneaky? 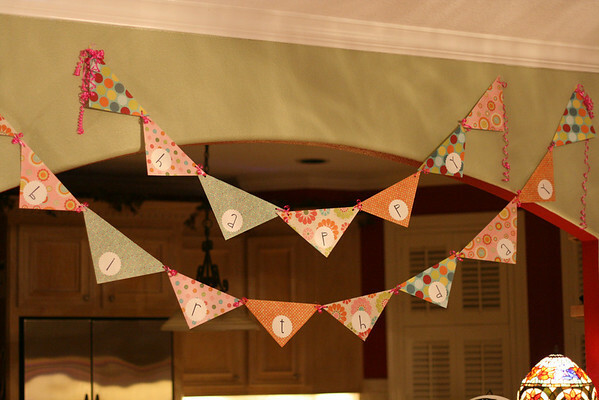 About those pennant banners: Does anyone know tricks or exact measurements for cutting them? I have heard of a die-cut, but of course I don't have that. After The Birthday: Act II last night, the Birthday Fairy and Birthday Wizard were so over the birthday whole experience. And yet there is an Act III being planned in 2 weeks. Must recharge. Looks like a great birthday and that the BG girl was very loved! The banner is adorable by the way. Great job. I think you save paper by doing two triangles per square. I mean, it seems like you would waste a lot if you tried to get three out of one. I can't fit my brain around three triangles from one square. Anyway, yours looks 'awesome'!! Oh my - what a timely find! (came here via Emily @ Chatting at the Sky) --- we just FINALLY finished about 4 weeks of birthday festivities for our (NOW, TODAY!) 7 year-old twins! And if you're questioning that microphone, DON'T try HSM Sing It for the Wii. COMPLETE with microphone, of course. Even if Princess A asks for it for no less than 6 solid months, as our princess did! And I see SU! pads and COOL key pads and a VERY cool Believe sign, and I think I've found another favorite new blog! Oh, yes, it's me again --- can't believe I failed to mention 13.1. We (Hubby and I) are running another in two weeks! 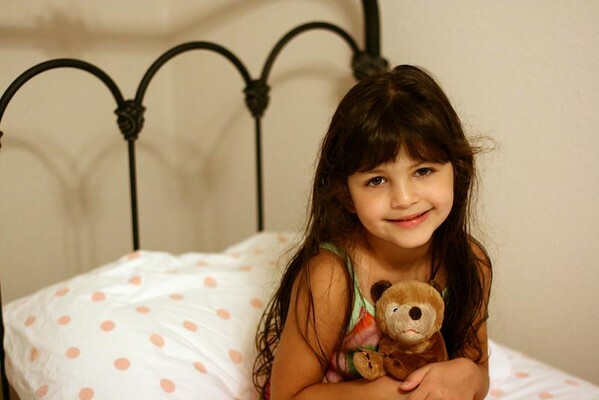 What a precious picture of her in bed. I love it when they are on top of the world and feel like they can fly. It is every sweet confirmation a mom needs in order to know they are doing a great job. The banner is adorable and I can't wait to see more photos. Way to go Holly! Happy B-Day A.! Good Mail Soon! Holly, Simple is good! Simple is good! I repeat (to you and me-Ha!) Simple is good! Happy Birthday Annelise!!!! Well done MOM, great photos and a great day all round!! Wow, you outdid yourself HOlly! But who better for than your birthday girl! 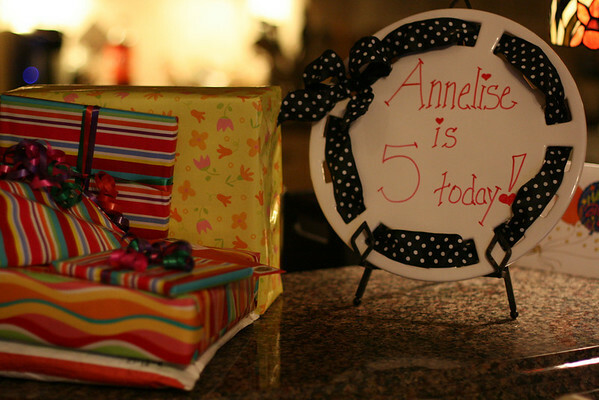 Love the plate and that banner - you did a great job :) And Happy Birthday to Annelise! Happy Birthday indeed! My Carter just turned five last week, and while I had a great time giving him a fun day, you did so many things that I didn't even attempt. And a guarentee his birthday was a one act play! 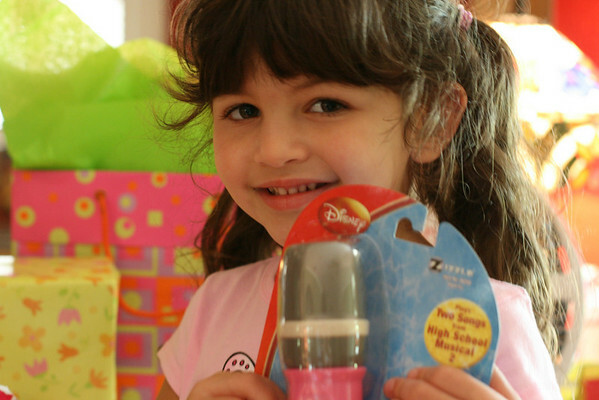 She is such a lucky little girl and it looks like she was completely impressed by her birthday fairy! I love, love your b'day banner!! I can't follow directions to save my life.